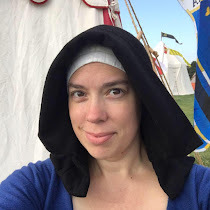 Each month I'm presenting a new tutorial on a medieval skill from various types of textile-related crafts. The purpose is two-fold. First, it will allow me to locate, study, and try a variety of new techniques I might otherwise overlook, and second, it's an easy way to get information out there about skills that other people might be looking for or find helpful. This month, I present Pattern Darning. It's sort of hard for me to believe that I didn't previously know how to do pattern darning, since it's a pretty basic embroidery technique, and the results can sometimes very closely mimic the motifs seen in 14th and 15th century brick stitch embroidery. But, indeed, it was an unknown skill for me. Until now, that is. When you do a Google image search for "medieval pattern darning", most of the results will be either Mamluk or Icelandic. A search for "kogin embroidery" will also show you the Japanese form of pattern darning, which was used as early as the late 16th century. Mamluk examples of pattern darning mostly originate from Egypt from the 12th century into the 16th century. 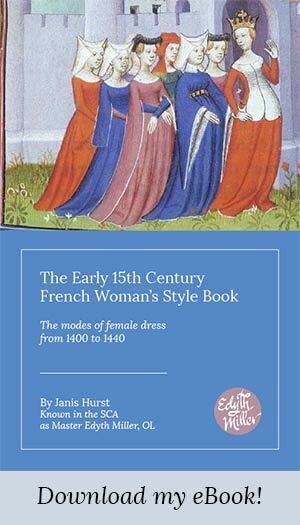 Many of the extant pieces are silk (blue being a very popular color) worked on linen. The patterns are typically worked in bands or borders, and in some examples, several differing bands are appiled together to create a more complex, larger designs. Icelandic pattern darning can be seen within the same period, but more of the extant pieces are dated to the later medieval centuries. 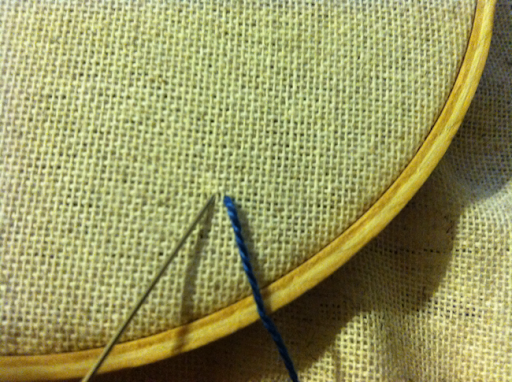 For the Icelandic variety of pattern darning, wool thread was preferred on linen. 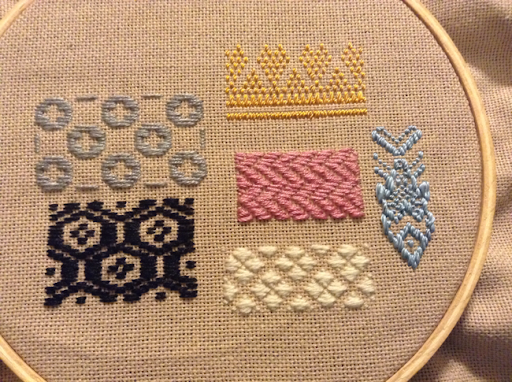 In my testing out some pattern darning styles, I created the small sampler below. After some trial and error, I discovered that the more even the threads on the field cloth, the easier it is to stitch the pattern (and the better the resulting pattern is). Ultimately I ended up using a piece of 28-count mushroom-colored cotton even weave. Since the field cloth is meant to become a part of the design (adding contrast to the thread) it's important to consider the color of the cloth carefully. In this case, the mushroom color lends itself well to a variety of different colors, each with their own overall effect. Each of my four patterns uses a different thread type. The pink chevrons (not necessarily a period pattern, but like I said, I was learning) are stitched using regular 6-ply cotton embroidery floss (not divided). The diamond pattern below uses some of Renaissance Dyes crewel wool (in natural white) doubled over. The black kogin zashi pattern was created with 3 strands of DMC linen floss. The grey pattern (another modern design) uses my favorite embroidery thread- Caron Impressions wool/silk blend. The blue fish was worked with Kreinik Serica filament silk. Finally, the gold Mamluk pattern was worked with Trebizond 3-ply filament silk. 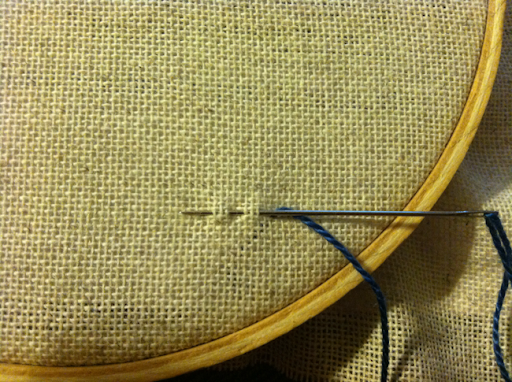 As you can see, each brings its own unique character to the darning which affects how well the eye renders the pattern. The shiny silk, for example, distracts much more from the full design than the matte black linen. All pattern darning creations use single lines of embroidery stacked together to form the design. The lines weave in and out of the field cloth, resulting in various lengths of dashes and spaces. Changing the order and length of the dashes and spaces on each consecutive line creates the design. While "pattern darning" suggests that the resulting design is a repeating pattern, the same technique can be used to create stand-alone motifs like the fish above. The important thing is that all the lines run in the same direction and are stitched from one end of the design to the other. Patterns for pattern darning come in a few varieties, some look like weaving diagrams, but the ones I find easiest to understand are specific to pattern darning, and use lines on a grid. For a great site with tons of Middle Eastern origin patterns, I recommend the Index of Charts for Medieval Middle Eastern Counted-Thread Embroidery compiled by Mathilde Eschenbach. [11/22/15: This link appears to be dead, but here's a link to a Google search that provides many great charts instead.] It's also a fun exercise to find an extant pattern and try to work the design out on your own, just to get a better understanding of how the designs are formed. For this how-to, I decided to use one of Mathilde's pattern diagrams called "flower in diamond". The design produces a band (which could be worked alone, or nestled between other band designs) with a floral pattern repeated through its length. To read the pattern, each horizontal dashed line represents a line of thread. The lines in this grid represent the open spaces of the field cloth (which is a bit counter-intuitive). 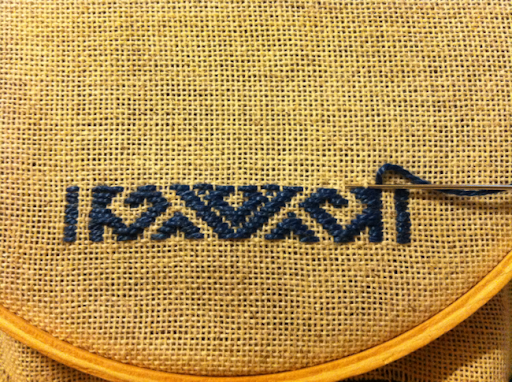 The pattern uses dash lengths of 1 to 5 threads, and spaces as small as 1 thread. To start, we need to chose a combination of field cloth and embroidery thread. 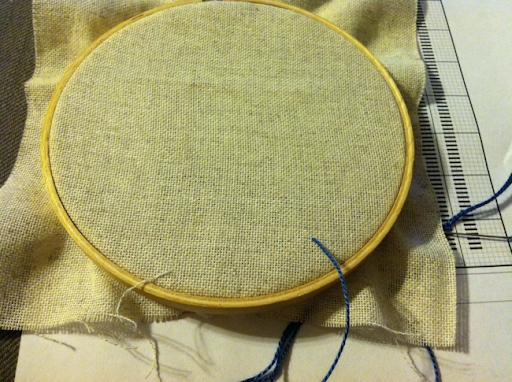 I'm going to go with a natural colored, 28-count, linen-style cotton and royal blue pearl cotton (size 5). I should also mention that it's possible to work pattern darning in multiple colors per design (here's an example), but I think there's something wonderfully beautiful about the simplicity of a single-color pattern. 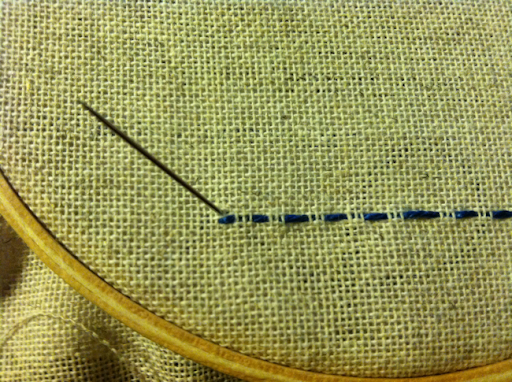 You'll also want a fairly blunt needle (small gauge tapestry needles work great). 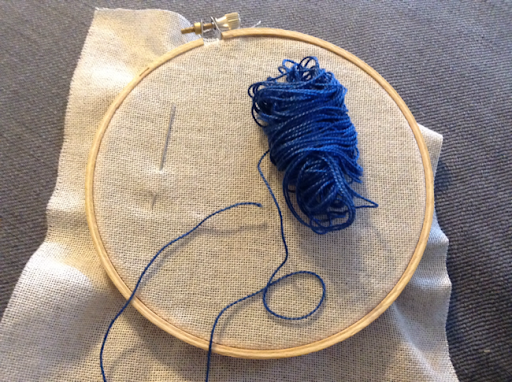 I'm using a hoop, but if you're used to doing counted thread embroidery without a hoop or frame, you can definitely try doing pattern darning without one. This technique is pretty straight-forward, so there's not much I can show you in terms of a tutorial, but here's a few images of the first few steps in the process. Bring the thread up from the back. I'm starting at the bottom right of the pattern, working right to left and up the design as I go. 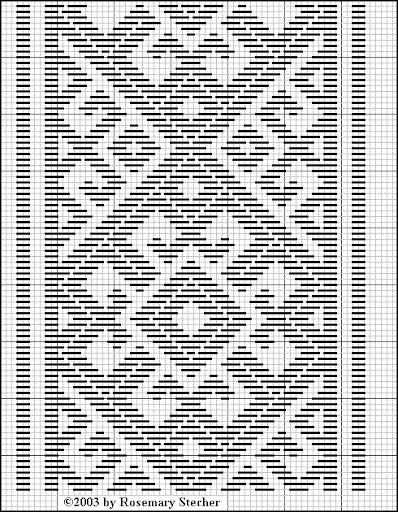 The first dash in the pattern goes over two open grid spaces, so I count two threads horizontally. Pattern darning is easy to work from the front, so I picked up the first three dashes, counting the threads according to the pattern for spaces (needle passes behind the threads) and dashes (needle passes in front of the threads). 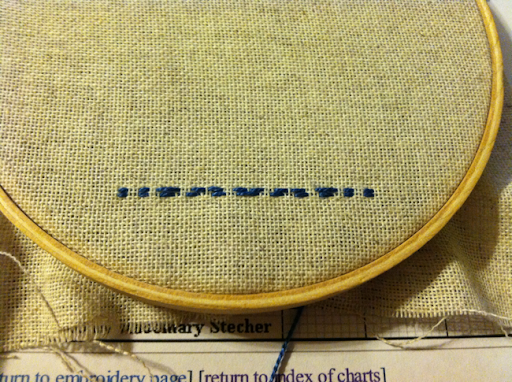 When I get to the end of the line, I move the needle up to the next line to work the pattern back across. 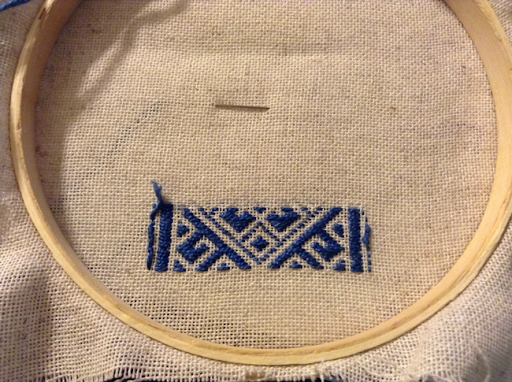 After two lines, I get a better sense of how my thread fills in around the threads of the field cloth. After several more lines, the pattern is emerging. The back of the piece shows an exact reverse of the front, in true weaving form. If you make an error in the pattern (it is counted embroidery, after all, and it can be easy to lose your place), it's extremely easy to rip out the thread back to the point you started. There are no crossed threads in the back or front to get caught up on. It's important not to pull the thread too tightly. Dashes that go over a single thread can easily be lost if they are too tight, and the threads of the field cloth, particularly on the edges of a design like this with straight bands, can shift and warp the pattern. It does work up fairly quickly, when you don't have children and work keeping you from it. I have not completed the full pattern yet, but hopefully this little how-to is enough the show you how pattern darning is created. When I've completed the embroidery on this piece, I'll share the result on Facebook, so make sure to like me if you're interested in seeing it! Wonderful tutorial! Thank you so much for sharing this! You're welcome! I've actually enjoyed doing these little pattern darning projects. They keep my interest with the counting, but are simple enough that I don't feel bogged down by their scope! Love the tutorial. The link to Mathilde's charts appears to be dead, sadly. Thanks for the heads up! I have updated the post with a note about the dead link and an alternative Google Search. Thank you for the tutorial, unfortunately the 'alternative' link appears to be broken also. Do you know where I may obtain this and any other of Mathilde's charts? It appears that Mathilde's entire site is now gone. The best I can do is suggest a search on google for charts. I updated the post above with a link to the results page.